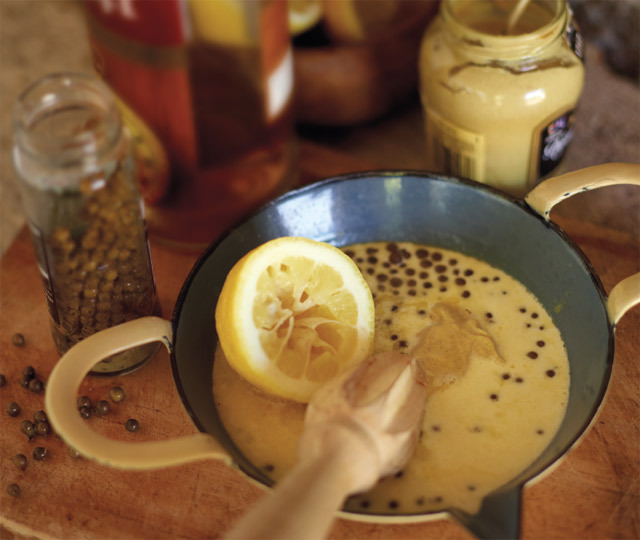 The trick to making this peppercorn sauce is locating the green peppercorns in the supermarket. They are sold in small glass jars and are usually hidden away on a shelf somewhere in the vicinity of the olives. 1. Drain the peppercorns. Keep 2 tots whole and crush 1 tot of the peppercorns in a pestle and mortar. Then sauté the lot in the butter for 2 minutes. Sauté means to fry in a pan with butter or oil. 2. Add the brandy. If you do not want alcohol in the sauce, flambé it now. To flambé means to set the ingredients of the pan alight so that the alcohol burns off. 3. Add all the other ingredients, heat, and stir continuously until the sauce starts to boil. It’s now ready. Reheat it before serving.